We use Geographic Information Systems (GIS) to obtain visual representations of scientific data for water bodies. We use it for most of our system-scale modelling work. It enables us to build a clear picture of an aquatic system. GIS allows us to view, interpret, and visualize data in different ways that reveal relationships, patterns and trends in the form of maps and charts. GIS is a versatile tool that can be used for various modelling purposes. Identification of sensitive coastal areas, aquaculture sites, environmental impact assessments and prospectivity mapping are just some of the functions GIS can be used for. 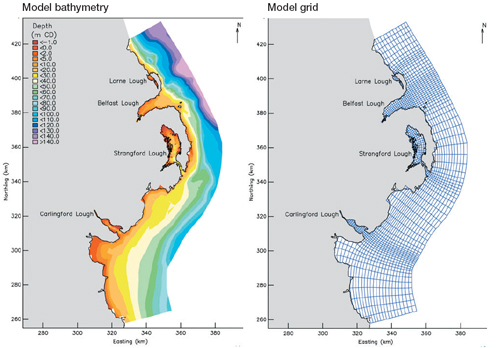 Bathymetry refers to the study of ocean depth and the topographic relief of the ocean floor, and is an integral part of the morphology analyses of aquatic systems. Other information for aquatic systems. ArcGIS is a tool that provides a framework for implementing GIS for many users, developed by ESRI. ArcGIS is a comprehensive, integrated, scalable system that can be used to meet the requirements for ecological modelling. If you would like to know more about our data solutions or have any questions talk to us .